I recently found myself on the wrong end of a lawn mower gone bad. It doesn’t owe me anything – it’s been in service for a good long time. A friend fixed it at the end of last year, so I wouldn’t have to go purchase a new one at the end of the season, when prices were higher. So, after twice being able to successfully cut a lawn that rivaled tall grass in country fields in the middle of monsoon season, my mower died for good. I’ll bury it next week. In the meantime, it provided a learning opportunity for me on the lawn mower features and values. Sometimes, unfortunately, there is no getting around spending the money. This would be one of those times. 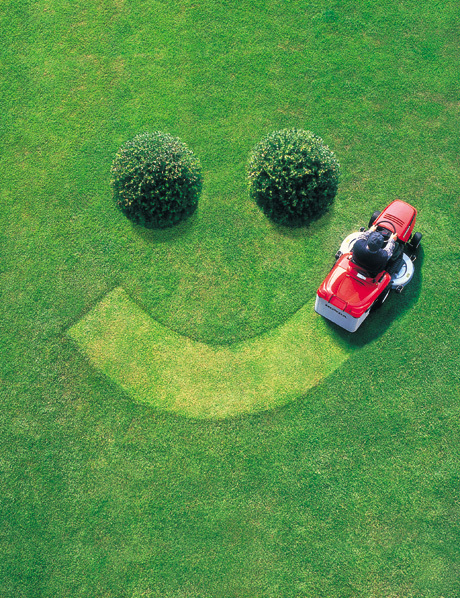 Buying a new lawn mower is not necessarily about saving money, but finding the appropriate value for your lawn care needs. Different lawns demand different styles of mowers – whether it is a walking or riding mower. As my lawn is the size of postage stamp, there’s no need to consider riding mowers, so we make the easy step to narrow the search to walking mowers. However, if you are in the market for a riding mower, I assume you can apply the same principles to riding mower costs & features. Also, if you are making an attempt to “go green,” in your lawn mowing experience, you can purchase a reel mower, which is a retro-style mower sans engine. There are two general types of powered walking mowers – a push mower and a self-propelled mower. Push mowers are the most economical mowers on the market. A self-propelled mower basically drives itself and pulls you along as it mows your lawn. Some models have speed variance levels to control the pace of the mower. Push mowers are propelled by your own elbow grease. Here’s where I had to make a decision. As much as I can appreciate a self-propelled mower, I have plenty of nooks & crannies in my yard that provide for mowing challenges. As I have to pull my mower in reverse, and around bushes & hard corners, purchasing a self-propelled mower may add to those challenges if it is not possible to turn off the self-propulsion feature. You also have options for bagging or mulching your lawn. One feature I was interested in having on the lawn mower was side discharge. The most cost efficient mowers generally do not include side discharge, from my research. I’m not much of a bagger, so the cheaper models were easy to discount from my choices. Another feature I ran across is quick-wash washout port. With this feature, you can attach your hose to the mower, and clean out the underside of the carriage. For my needs, this was purely an optional feature. In the end, a regular push mower fit my needs best. By default, it also was better on the bank account. However, given a different set of lawn care variables, I could have just as easily purchased a self-propelled mower. It would be easy to say “go out and buy the cheapest mower you can find.” But that glittering generality may not be the best route to take. Other avenues to consider when you are resigned to buying a new mower are mower maintenance shops or garage/estate sales. 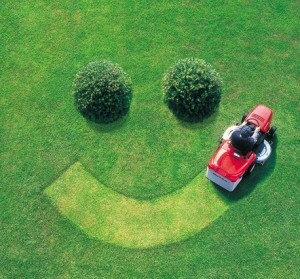 Sometimes you can find a quality used mower to keep you going all lawn mower season long at reduced costs. Any way you cut it, purchasing a new lawn mower is based more on the features needed to suit your lawn than the cheapest mower available. Let’s start with this: I’m not a coffee drinker. So, I certainly do not know what it’s like for coffee-holics to wake up and not have their coffee. In Dolly Parton’s dedication to the working class, “9 to 5,” the need for “a cup of ambition” to “try to come to life” is definitely understandable given today’s get-up -&-go lifestyles. Maybe I’m lucky; maybe I’m missing out. Whenever I’m having a cup of java, it needs to be dressed up so it doesn’t taste like coffee as much as whatever creamer or syrup is in it. But that doesn’t exclude me from the high costs of purchasing java drinks, wherever I may be. Let’s keep your love of coffee going, but at a more delicious savings for your budget. Reduce trips to expensive coffee houses. Yes, I know, for some this may not only be near-impossible, but it may also be sacrilege to even suggest – until you start doing the math, that is. Take your average cost of regular coffee – not latte’d, frapp’d, or skinny’d – of roughly $2.00 per medium serving at the chain stores. By the way, if you choose latte, frap, or skinny, that average bumps up to about $3.00. If you’re visiting your neighborhood store enough for the baristas to know your name, it’s an opportunity for you to create savings. Stop going so often, and take the money you would have spent and put it in the savings jar or shoebox. Then, see how fast you need to empty it, or get another jar or shoebox! If you just cannot be without your favorite chain coffee store coffee on a daily basis, look for specials. In a major coffee shop chain store I walked into recently, offers were posted for a 50-cent discount if you use your own mug and another 10-cent discount if you could correctly answer their trivia question. This can be viewed as a seemingly small savings, but bundle them together over ten trips, and you have some extra coffee money! Find a locally owned & operated coffee house. There are “mom & pop” coffeehouses – small businesses – that offer a savings over the chain stores. Hidden java gems may be on the opposite side of the plaza from the chain store. It may even include a different music selection, interior design, or clientele. You won’t pay the mark-up found at the chain stores, and may even find something more creative. You may even enjoy the atmosphere better, as well as contributing to a local business entrepreneur. Buy your morning coffee at the local gas station. That’s right, I said it: this is one item you can buy at the gas station convenience store and actually get your money’s worth comparatively. Some of these gas stations increase your savings by offering a mug club of their own – buy a mug & your refills are reduced by 20 cents per fill-up. To start, you’ll be dropping a smaller amount to help you through your day – roughly $1.20/$1.30 for 20 ounces of “ambition” at two different gas station chains in my area. And if you make the “investment” of $4 or $5 on their mug, you’ll be saving on top of that! The savings may seem paltry per individual purchase, but over a standard five-day work week, that’s $5. If we multiply out, that’s $20 per month, $240 per year. Still think it’s a small savings?! If the gas station version does the same trick as the chain store coffee, then you’ll enjoy that savings even more. Buy a coffeemaker. You will recoup the costs in a manner of weeks by reducing trips to your chain coffee providers. 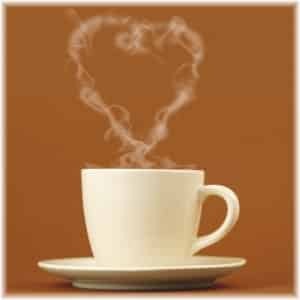 Granted it’s not as romantic as slapping down your cash for someone else to pour your coffee, but makes a lot of cents. Plus, if you buy a style that can be programmed, the aroma may help motivate you to get out of bed in the morning. Again, I’m not a habitual coffee drinker, but when I visit good friends at their home in the mountains, my great friend’s wife programs the coffeemaker to start brewing at sunrise. There’s almost nothing better than that cup of coffee in the early morning hours watching the sun come in over the mountains. And, after you buy the coffeemaker, buy coffee at the grocery store. Your per pot cost will be cheaper than your per cup purchase at the coffee shop. And, if you grab a coupon, you’ll reduce some of the ever-rising coffee costs! Changing your coffee-buying habits can help you achieve more savings. You pay heavily for the “convenience” of waiting in line & stirring up the money for your daily cup of coffee at the local coffee shop. But if you choose to cut corners, you can grind out some savings and still “survive” with alternative solutions. Dolly’s “cup of ambition” can be more attractive at a lower cost, saving you money for more adventurous pursuits than standing in line to order designer coffee. Is It Really On Sale? The outdoor furniture set you want is in this week’s home improvement store advertisement. As you’re thumbing through the discount store advertisement, you run across a picture of the vacuum cleaner you’ve been eyeing up for a while. Since the item is in the advertisement, you assume it’s on sale, but that may not always be the case. Make sure to do a little research before you pick up a costly item that appears in a weekly advertisement. Retail organizations use a variety of tactics to create the illusion of a sale, one of which is to place items in their weekly circulars with the regular price. This strategy relies on the consumer to assume the product is on sale. The concept may sound obvious, but some products do not ever really go “on sale.” So, the retail store advertisement is still moving merchandise by advertising products, regardless of whether they are being sold at a discount from the regular price. What the retail stores count on, is that consumers will believe the inference that all items in the advertisement are on sale, when this may not be true. Take a number of precautionary steps to determine whether or not that bigger-ticket item is actually a good value. First, take a closer look at the advertisement; does it show a savings amount? If so, then odds are that the item is discounted from the store’s regular price. Another step is to check online. Some competing online sites may offer a better price on the product, along with free shipping. The online site for the same store advertising the product in the weekly ad may also list a different price online. Also, check with friends who may be more familiar with the item. For example, although I am surrounded by electronics products that I’ve recently purchased, I am fortunate enough to have some friends who are more knowledgeable about the gigabytes, terabytes, and operating systems of these products. So, I often ask for their advice in my comparison shopping & research to make sure I’m getting the best value I can at the time. Since buying a new laptop and a new desktop within the past year, I have yet to see comparable items at the same value level, which is a testament to the research and advice I’ve received from those with expert, or at least better, knowledge. Do some preliminary research on products to determine the price trends. Odds are, you are not going to pick up the Sunday ads and decide to purchase a laptop, outdoor furniture, or vacuum cleaner without having some forethought on these products. When you are at stores running errands for other reasons, check out the regular pricing on these products. This will help you determine whether or not the item is really on sale when you see it in the store advertisement. This simple preliminary step can help you get familiar with both the product you have in mind, as well as similar items. Product features can vary, even within a similar price range. Saving money when shopping for more expensive products can be made easier with a little bit of research & asking some questions. It doesn’t have to be a rocket science or an extensive process, but when you are looking to purchase items beyond your normal purchase level, or what would be considered big ticket items, you should always do a little research. Keep the “I want” voice at bay long enough to make sure your decision to purchase is one of value. 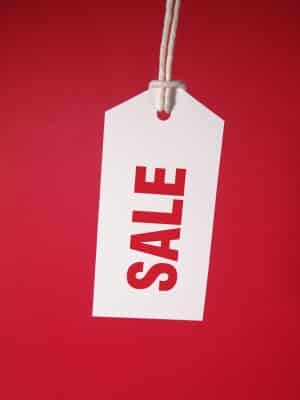 Make sure the sale is an actual sale that benefits your bank account, not the retailer’s. The last component of “Saving Money…The Hard Way Made Easy,” is to watch your savings grow. This component is the culmination of all that you do to get there: setting goals, cutting coupons, shopping at the grocery store & discount store instead of the convenient store or gas station shop, and cooking & eating more at home. The concept is sometimes difficult to make tangible at first, at least until you start to see the savings. Even then, you feel that your efforts aren’t producing the instantaneous results they should. First, no one said it would be easy. It takes discipline to save. It’s much easier to fall victim to the “I want” voice in your head, and the small expenditures that are rationalized in your mind than not. Cutting corners & following a savings plan will help your savings grow over time. You have to find the small corners in your life to cut. Everyone’s living style is a little different, so the guidelines are a starting point. YOU have to be the one to initiate & implement your savings plan. Where do YOU see careless spending in your habits? What can YOU change to improve your savings? Have YOU set savings goals? Do YOU make an effort to cut coupons before you go grocery shopping for those items you use all the time? Do YOU shop at the grocery story & discount store for your food items & every day products? Are YOU prone to purchases at the convenient store or gas station shop because it’s, well, convenient? Are YOU eating out a lot for lunch or dinner? A self-evaluation of your spending habits is a good place to start developing your savings plan & goals. Your savings will eventually build momentum for more savings. Starting a savings program from scratch is a difficult and gradual process. Developing a savings plan & seeing tangible results takes discipline, sacrifice (however mild or severe), and effort. Although it will be tough initially, you will see tangible results in time. A point to be made here is one of the lessons my father taught me long ago, but as with many parental words of advice, it fell on deaf ears in my younger years: never take food off the table. Meaning, that there will be times that you might not be able to make your savings goal for the month in order to provide for immediate or primary needs. Emergencies & unplanned expenses come up all the time; it’s called “life.” However, these unexpected twists & turns are no reason to feel defeated. Just re-ignite your savings plan with the next cycle. Once you see the results, you should be motivated to keep on saving. 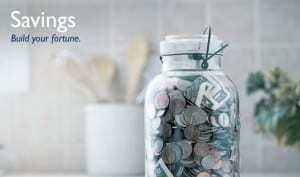 As the jar in the cupboard, or the shoebox under the bed starts to fill up, or as you start to see more money in your checking or savings account than normal, you’ll feel better about your plan and results, and want to save more. You’ll want to add to the jar, shoebox, or account until it appears to be overflowing. Now, not only will your savings will be growing, so will your money-saving confidence. Just like others who are successful at finding those small corners, you’ll be looking for the next one to cut. You’ll want to continue to watch your savings grow. I’m all about eating out – pizza & wings with friends, dinner at the ballpark or arena, a nice meal where I’m required to wear a shirt that doesn’t have a band logo for the most recent world tour. Occasionally, I’ll even “get crazy” by paying attention to healthier eating habits by opting for veggies instead of French fries. Of course, by ordering veggies, I realize I conjure the clouds of Armageddon. There are valid & enjoyable reasons to eating out and about: saving time, little effort, enjoyable cuisine adventures & new food experiences, great conversation with friends & family. However, it’s also an easy way to spend unnecessary funds. 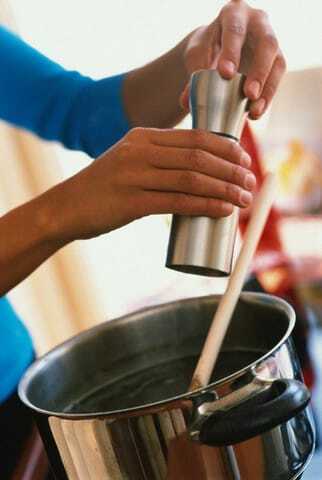 The next component from “Saving Money…The Hard Way Made Easy” focuses on cooking & eating at home. By choosing to cook & eat most of your meals at home, you will perpetuate your money saving momentum. It’s easy to put off regular grocery shopping & view dinner out as “only $10 or $20.” But, if you think about it a little more, $20 can buy you a variety of food items, and a NUMBER of meals, at the grocery store. And, $20 is just one meal out with tip. Granted, time and effort commitments increase – grocery store time, food prep time, and (yuck!) clean-up time. But the bottom line is it’s such a drastic difference in spending, you’ll be proud of yourself for dusting off one of those old cookbooks & finding a good recipe to try. Odds are once you adjust to the habit of cooking at home, you’ll also choose to eat healthier, as well, since you will pay attention to what ingredients you are using when you cook. Oh, and don’t fall victim to one of Temptation’s biggest spells: buying lunch out at work! This one sneaks up on you. We think nothing of what is called a “bargain” lunch, or value meal at $5. It appears to be a reasonable amount to spend on lunch every day. But think about it: multiply it by four or five. Now, you’re talking $20 or $25 per week. Now, multiply that by four. $80 – $100 a month for lunch! Again, this speaks to your little voice – the “I want” voice. We know it’s much easier to give in to Temptation, to rationalize that you don’t have the time in the morning to whip up a sandwich, piece of fruit, & snack to put in a brown bag. I know – you’ll be on the run all day, won’t be in your office, or won’t have the “luxury” of taking a lunch break. I feel for you, as grabbing lunch on the run is easier, and suits our instant gratification gene better than the brown bag sitting in the community refrigerator. But taking your lunch, and avoiding the $5 spend every day keeps that money in your pocket. Make the time to do weekly grocery shopping for your lunches & dinners. It’s easier than you think, and will save you a lot of money. This isn’t about being the “no fun police,” busting in on your nights out. We all need to get out to enjoy a meal in celebration or socialization. This isn’t about the occasional, or even weekly, night out. This is about the daily offenders. You’ll find the dent in your wallet or purse to be a little less significant if you pay attention to how many times you eat out. Even if you reduce your dinners out, or take your lunch to work twice a week, you’ll notice a difference in money spent. Choosing to shop for your meals at the grocery store instead of eating out is yet another way to make saving money easy. Ah, the romance of the open road; the sun is shining, the windows are down – you are ready for adventure. You stop for gas and a soft drink taking a moment of pause in your day. After opening your soft drink, you fire up the engine and go on your way. Five minutes later, you’re unlocking the door at home. Wait. What just happened? OK, the actual scenario is this: you make your way around town running a few errands, stopping at the furniture store, the bank, & then stop at the gas station, picking up a soda. You’re right – it’s only a buck & some change. But how often do you do it? Every week? Twice a week? Today, we examine the component of shopping at the grocery store versus the convenience store as the next component of “Saving Money…The Hard Way Made Easy.” It’s not the “once in a while” pick-up at the gas station or convenient store that adds up, it’s the weekly stop. Add up the times you’ve grabbed a quick pop on the road, and it could be a small fortune. There’s an easier way to have a soft drink or water on hand to quench your thirst when you are running errands: grab it on your way out the door and have it in the car already. Shopping at the grocery store or discount store instead of the convenient store or gas station shop can save you money. Convenience stores and gas stations charge a higher price on most products due to limited selection, lack of volume buying power, and, of course, to reach a higher profit margin. These stores serve an essential purpose in a product “emergency,” but also prey on your impulse to buy. Don’t get me wrong, I fall victim to that evildoer Temptation just as much as anyone else. There are times those products are calling me when I’m in the store to pay for gas. But I always try to rationalize: how much I need that extra product, how close am I to home, and does it make sense to purchase? Granted, those gate-keeping questions take the fun out of instant gratification purchases, but they also keep more money in my pocket. This doesn’t mean that your local grocery store or discount store is always your best bet to assure yourself of the lowest cost. You still have to watch advertisements for sales. And, unless you’re in a pinch, buying your hardware or food storage containers at the grocery store is not going to save you any money, either. But, if you pick-up your soft drinks, water, juice drinks, and to-go snacks at the grocery store, and have them on hand to put in the car for your errand runs, you will save on the higher costs on those at the convenient store or gas station. It’s not always the big purchases that make the difference in our wallets, pocketbooks, & savings accounts, it’s the small ones – the small purchases we don’t necessarily notice or evaluate as significant. What we have a tendency not to miss are the nickels & dimes. That’s what convenience stores & gas stations are counting on: our impulse to buy rationalizing out the missing nickels & dimes. There’s nothing wrong with a quick stop when you’re on the open road, but save it until you’re actually on the open road instead of five minutes from home. Do you want to make a quick buck? How about five or six greenbacks? How about ten? This isn’t a hoax, joke, or ponzi scheme. All it takes is a few moments of your time, and a pair of scissors. Today, we look at “cut coupons,” another key component from the original article “Saving Money…The Hard Way Made Easy.” Yes, I know it may seem like a hassle or time-consuming task, but I promise, this is an excellent way to save money. And, it takes less time than you think. Cutting coupons provides an instant discount on your every day purchases, and allows you to try new products at a cost savings. Yet, most coupons go unused. They lie idle inside your Sunday newspaper, and are generally destined for the landfill or recycle bin without ever serving their purpose. Coupons are available from a variety of sources – newspaper, weekly mailers, online websites, & stores. Take the time to look through your Sunday or Wednesday newspaper. The days coupons are included in the paper may vary by local area. Also, don’t let the actual newspaper sneak by – some papers print coupons within their pages of sections for you to visit & save at specialty shops, as well. You won’t use every coupon, but odds are coupons are available for your favorite shampoo, canned goods, and paper products. Companies also use coupons as an enticement for you to try their new products. Pick up that new frozen entrée you’ve wanted to try when you see the coupon in the newspaper. 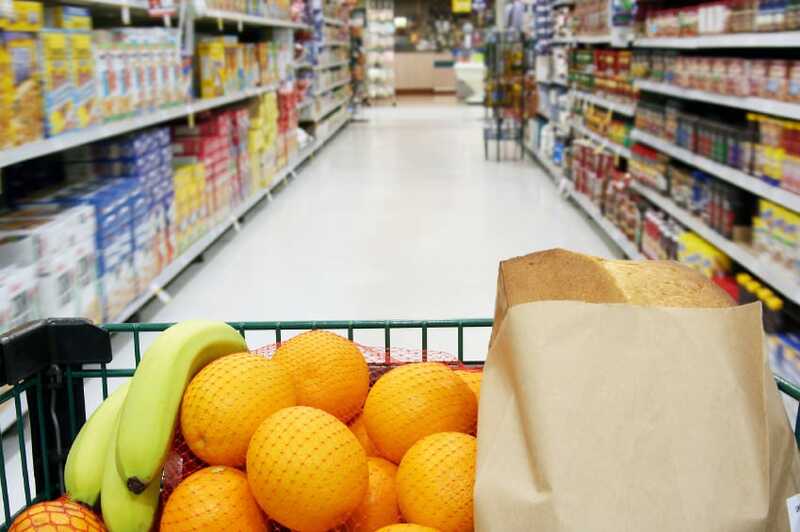 Combining coupons with grocery store sales can increase your savings exponentially. It doesn’t take much to leaf through the weekly grocery store ads – roughly six to sixteen pages, depending on the store size. Five minutes with the weekly ads, along with a few minutes cutting coupons can add up to big savings when you hit the grocery store. Think about it: why pay more for those things you are going to buy anyway? Just because you don’t have those few minutes to leaf through the paper?! Some grocery stores offer double coupons, up to 99 cents. So, for every 35 cent coupon, you actually save 70 cents. Truly, the interest on your average savings account can’t rival that kind of return on investment! And, if the product is on sale, that savings increases even more. 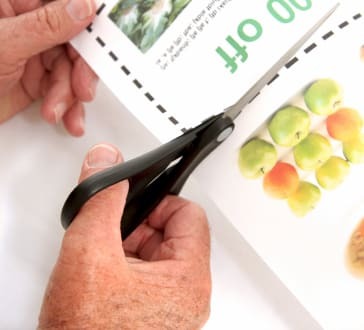 Cutting coupons is an easy concept that most don’t put to good use. Don’t be that person! Be a savvy shopper! Take the time every week to wield those twin blades cutting coupons, and scan the ads before you go to the store. The savings quickly add up. So, you still aren’t convinced it’s worth cutting coupons? Try doing the simple math. If you save $4 during your weekly shopping through coupons & grocery store sales, that’s a little over $200 dollars saved in a year. That’s money you can throw in your bank account, or put towards something fun – like tickets to a ballgame or concert. Now, where are those scissors? From the original article “Saving Money…The Hard Way Made Easy,” we will examine each of the five different components in expanded detail. The first of these components, “set goals,” is a basic concept for anything you are striving for in life, and it is no different for financial goals. Yes, we all say that we want to have more money, which leads to more independence, and more opportunity. But do we ever quantify the amount of money we want? Or, do we just say “we want to be rich,” or “we want to be able to retire early,” or any of the myriad of other options? Let’s take some goal setting tips and apply them to saving money. Take the time to write your goals down on paper. When we write down our goals, we are more apt to work towards them, to keep them in mind, and to visualize them. And after you’ve written them down, post them somewhere. As silly as it sounds, my goals for the year – financial, fitness, relationships, etc., are posted right on my bureau mirror in my bedroom. It forces me to look at them every day. It’s also important to be specific when setting goals. “I want to be rich” or “I want to retire early,” are good mental images to have, but those statements carry different meanings to different people. How much do you want to save per week? Per month? How much do you want to see in your bank account at the end of the year? Specific milestones garner specific results more often than general milestones. Saving money takes effort. There’s no doubt about it, it’s not easy to save money. It takes discipline and sacrifice. Sometimes, it’s a matter of logistics – the money just doesn’t stretch as far from paycheck to paycheck. As Steve Azar sings in “Moo La Moo,” “there’s too much month at the end of the money.” Even those thrifty savers with the best of intentions often miss out on savings because of bills. Don’t be defeated! As my dad always tells me, “don’t take food off the table.” Live with it and make a better plan for the next cycle of paychecks and bills, if you can. Another battle is always raging, of course, with that dark villain to your intentions: Temptation. The American Dream ingrained in most of us is that if you work hard, you can reach your goals and get what you want. Temptation fights Discipline & Sacrifice on every playing field. This is where you need to keep that “I want” voice at bay! The more you stand tall against Temptation, the better your odds of seeing your savings goals become a reality. Focus on why you are setting financial goals. There are obvious reasons for saving money, and not so obvious reasons. Why are you saving? For a new car? A new house? A child’s college education? Early retirement? Ease of mind? Don’t we all wish we could meet those goals consistently?! Of course, when you add your personal philosophy to the mix, it can get confusing! For example, if your life’s philosophy is “live for today,” then it would be in direct conflict with setting any savings goals for the future. Focus on your savings objectives, and make sure your goals match your lifestyle and direction. A major portion of setting and achieving goals is determination. Setting goals and sticking to them is not always easy. Here’s where you have to keep a couple of things in mind: be positive, and believe in your direction. There will be times, no doubt, that you will not reach your goals. What matters is being positive about what you have accomplished towards your savings. Don’t throw in the towel! Get back in the ring and try again! By believing in your direction and staying the course, you will continue to work on your savings plan and reaching the goals you’ve set. The ironic thing is, once you reach your goals, you’ll be inspired to save more! Each milestone along the way will serve as an affirmation of your savings accomplishments. Celebrate with a wry smile to your friends in arms – Discipline & Sacrifice. Eventually, you will be able to take down your original goals posting, and write a new savings goal to achieve! Saving Money…The Hard Way Made Easy. It’s not easy saving money. It’s even harder with all of the advertising & marketing ploys we are bombarded with every day, every hour, and every moment. Psychologically, those advertisements and ploys create the need in our minds, and suggest you to say “I need” or “I want” that item. If you can curb the “I want” part of your inside voice, that’s half the battle. Of course, after you pay all the bills, and find out, if you’re lucky, that you just might be able to order pizza on Friday night, that’s exactly when “I WANT” screams the loudest in your mind! We can’t help you fix that. What we can do is try to offer some quick tips to lock your “I want” voice in the financial skeleton closet for the weakest moments. What we won’t do is fill your mind with widely impractical advice. You know the kind – where the writer tells you to shift your car into neutral at a red light, lick the spoon you dipped in the yogurt tub before you rinse it off, or cut large magnets into smaller magnets, so you don’t have to buy more to post pictures on your refrigerator. Really?! Just so we are all on the same refrigerator panel, cutting magnets into smaller magnets is not a significant way to save money. Below are some practical tips you can easily incorporate into your daily activities to help you save money, no matter how hard it seems. Set Goals. And after you set your financial goals, write them down and post them. Post them anywhere – your mirror, dresser, cubicle, or car. They will keep you focused on what really matters, especially when you see that sign offering that special sale on that pair of shoes you don’t really need. Also, check your bank for special savings goal-tracking offers. Some banks have savings programs that reward you with a gift or gift card just for meeting your savings goals. And remember, as you reach milestones toward your goals, it will give you the confidence to keep the momentum going – to keep on saving. Cut Coupons. No really, cut them out and use them! It’s not embarrassing, and you don’t lose any pride by using coupons. Most coupons go unused, believe it or not. You can find them in your local newspaper, online, and even at the grocery store. 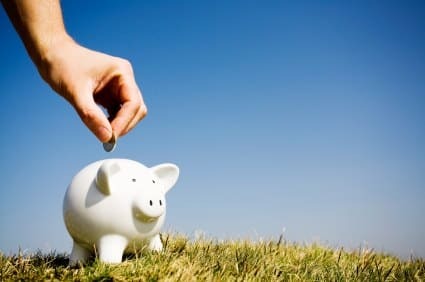 And, you get more of a return on your money these days by using coupons than the interest on a regular savings account. Shop at the Grocery Store or Discount Store – NOT the Convenient Store or Gas Station. The mark-up on items in those little stores are quite a bit over your regular average grocery or discount store. Save those moments when you’re out on the open road. In the mean time, pick-up your road pops at the local grocery story & grab one when you’re on the go. Cook & Eat at Home. Plain and simple, cooking & eating at home saves money. Dining out is a fun & easy temptation – no food preparation, no lost personal time, and no dishes! But you pay for it every time. But by cooking your own meals, you can save money, and make your food exactly how you like it. The added bonus is, in a lot of cases, is by cooking at home, you’ll be eating healthier. Just stay away from cooking with butter! Watch Your Savings Grow! 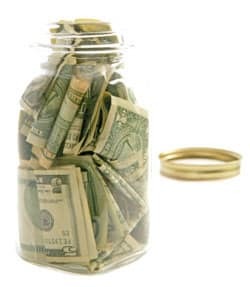 Every time you save some money by using coupons, or eating at home, drop that savings into a jar. You’ll watch it grow so that it no longer fits in the jar, and then you can deposit it into a savings or money market account. Although interest rates are banks are low, you still have the pleasure of having your money by cutting a few small corners. There you have it – some practical tips to save money and make your savings grow little by little over time. And, over time, your savings will grow exponentially. It’s not easy to save money in today’s economic environment, but its well worth the effort for your future. By focusing on these quick tips, you can resist the temptation of immediate gratification, and keep both your savings plan, and the car, in “drive” at the stoplight!